Just a quick update today. The sod is completely removed and work has begun on installing drainage pipe around the perimeter of the field. Here's your daily panorama showing the field in it's current state. Also of note is the new scoreboard that was installed last year. I noticed a crew working near it & went to investigate. What I saw was this..
Notice the lights coming out from the bottom? Those are new. If you recall from last season, when the sun set, the 10 advertising panels were almost impossible to see due to the lack of lighting. 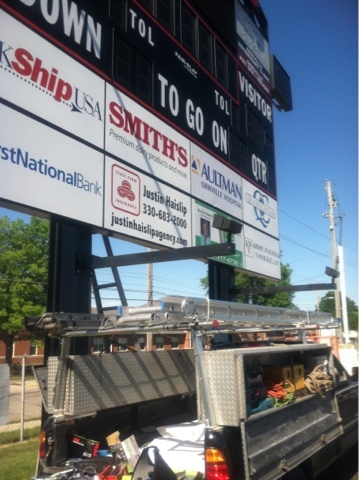 These lights will take care of that problem & give the scoreboard a nice finished look at night. Maumee Bay Turf has been kind enough to send along updates as they progress through this project and it was agreed that this is information that the turf committee wants to share with the public, just to keep folks up to date with accurate information. installation of perimeter drainage system will begin tomorrow and should take all of Thursday and Friday. field will be compacted and proof rolled by Friday June 15th. Burkey Excavating will be quitting a bit early Friday to allow Relay for Life to hold their event. curb cut (along inside perimeter of track) will transpire Monday or Tuesday. surveyors will be on site Monday or Tuesday to locate control points and stake for new goal post/soccer goal sleeve installations. Vasco Group will be on site early week to pour track event (long jump & pole vault) runways. installation of geotextile subgrade liner and flat panel system along with install of stone field base will begin Friday the 22nd or Monday the 25th. I know I'm repeating myself a lot...but it needs to be repeated...the project has begun but the fundraising is on-going. Contributions can be mailed in care of the OHS Booster Club, or donations can be made online via PayPal. RedRiderTurf.com has all the info. The goal has not been met and fundraising will continue until that time. When completed, this project will vault Red Rider Stadium into one of the nicest facilities in the state for a school our size. In the last 5 years, we've seen new visitor bleachers built, new home bleacher coverings, new lights, a new scoreboard and now turf and track. We're certainly a blessed and fortunate community to be able to provide a facility like this for the next generation of Red Riders. Turf Update with Pictures: Work has begun! !